Today 31 March the Federal Council of Germany confirmed once and for all: it is forbidden for professional drivers to spend the weekly rest in the vehicle cab. Germany is the fourth EU Member State – after Belgium, France and the Netherlands – to enforce the requirements set in the driving and rest time rules: the driver can only spend the daily and reduced weekly rest in the vehicle, and that only with the driver’s consent. Great Britain is considering similar measures. The ETF salutes this decision and points out that road transport undertakings – and not the drivers – must be sanctioned for failing to organise drivers’ weekly rest in compliance with the rules. 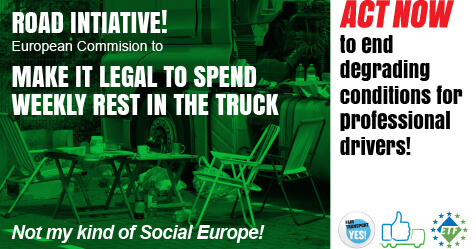 The European Commission should now clarify the law and specify that drivers must spend the weekly rest in decent accommodation conditions: motel or hotel room with own sanitary facilities and access to hot meals. But will it? The Commission is currently assessing some scenarios according to which to drivers will have to work 3 or 4 weeks before taking a full weekly rest of 45 hours. If any of these scenarios becomes part of the DG MOVE Road Initiative, drivers will only be entitled to 2 or 4 days of rest away from the vehicle while now, the current rules entitle them to 7 nights spent outside the vehicles cab. In the recent months several Member States have been subject to scrutiny and even infringement procedures by the European Commission for adopting measures to curve fraud, criminal activities and social dumping in road transport. Furthermore, there are clear signs that the road initiative is 100% market-oriented and there is nothing in it to safeguard safety of drivers, passengers and of other road users. “The European Commission has lost any contact with the reality of the sector. Instead of understanding and addressing the real concerns of these Member States, instead of engaging with the people working in the sector, they persist on a course of action that will further deteriorate social rights, working conditions and road safety. And as the European Court of Justice may soon confirm the approach of Belgium, Germany and France, the European Commission’s only chance to trick them is to change the law and make it possible to spend as many week-ends in the cabin as possible.” said Roberto Parrillo, President of the ETF Road Transport Section.